1.1 This website is owned and operated by Elephant Art Limited. We are registered in the UK (technically “England & Wales”) under number 10084105. Our registered office is at The Studio Building, 21 Evesham Street, London W11 4AJ. 1.2 These terms and conditions apply when you buy any goods via this site or otherwise use this site. 1.3.2 it is unlawful for you to buy or use the goods in, or import them into, your country. 1.4 We may change these terms and conditions at any time. Please check them carefully as they will apply to any new purchases made after the effective date shown above. 2.1 If you are a consumer (i.e. 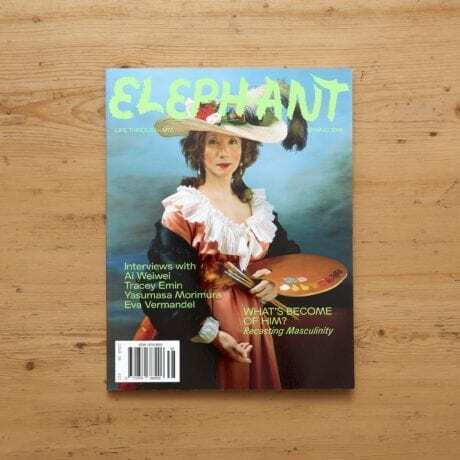 acting for purposes outside a business), you have the right (ending 14 working days following the day after delivery of goods or, in the case of a subscription, ending 14 days after the delivery of the first issue) to cancel the contract by email to shop@elephantmag.com or any of the other methods specified in the Consumer Contracts (Information, Cancellation and Additional Charges) Regulations 2013. If you cancel in this way, we will refund the price paid for the goods (or the first subscription charge) plus standard delivery charges attributable to the cancelled item (which does not include any express delivery charges for faster delivery services which you requested). You are required to take reasonable care of the items and to return them in saleable condition. 2.3.3 you carefully package the goods – in the original packaging if still available. 3.1 We may offer discount codes from time to time. Such codes may only be applied to purchases made through the account in respect of which the discount code was offered and registered. Unless otherwise stated codes are only available for orders placed online, and can only be redeemed once per customer. Other terms may be applicable to specific codes; please check the terms provided with the discount code before using it. 3.2 All discount codes refer to the price excluding delivery charges. We reserve the right to discontinue or otherwise modify any discount codes at any time without prior notice. 4.1 We will take reasonable care to ensure that representations and descriptions of goods appearing on our website are correct. We have made every effort to display as accurately as possible the appearance / colour / texture / finish of our goods. However, what you see will depend on your monitor and computer equipment and so you acknowledge and accept that there may be minor differences between the actual goods and the way that they appear on the screen. For example, the colour tone may differ. 5.1 Payment is in advance by the means stated on our website. Dispatch of the goods is subject to our receipt of full payment in cleared funds. 5.2 The price for the goods you order is as stated on our site at the time you send us your order. VAT or sales tax is included unless we say otherwise. 5.3 If we have mis-priced any item by mistake, we are not obliged to supply the item at that price provided we notify you before we dispatch it. If we do notify you, then you can decide if you want to order the item at the correct price but, if you don’t, we will provide a full refund of any payments already made. 6.1 Your order is an offer to buy from us. 6.2 You must ensure that your order and any other information you supply to us is correct and you must promptly update us if there are any changes. 7.1 There will be no binding contract of any kind between you and us unless and until we accept your offer by actually dispatching the goods to you. Until then we may decline to supply the goods to you without giving any reason. Nothing else that we do or say will amount to acceptance of your offer. If any goods are unavailable, we will notify you of the unavailability as soon as possible and will arrange for a full refund if you have been charged. 8.1 Delivery will be to the address which you specify when ordering. We may deliver different parts of your order on different dates. 8.2 Delivery costs are charged at the rate shown on our site when you place your order. These will depend on the delivery method chosen. NB The delivery charges do not include customs or import duties which may be applied to your order by the relevant authorities. It is your separate responsibility to pay for these; failure to do so may result in delayed delivery or the failure of delivery altogether. You may not be entitled to a refund of the purchase price if your failure to pay customs or import charges prevents the delivery of your order. 8.3 We will do our best to arrange delivery within the time specified on our website or, if none, within a reasonable period. We are not liable for late delivery to the extent that this is due to circumstances beyond our reasonable control. 8.4 An extra delivery charge may become payable if no-one is present to accept delivery and either you haven’t provided alternative delivery instructions or else you don’t collect the item from a holding depot within 7 days. 8.5 Risk of damage or loss to the goods passes to you on delivery or if you wrongfully refuse delivery when delivery is attempted. 8.6 Nothing in this agreement in any way limits or excludes our liability for negligence causing death or personal injury or for fraudulent misrepresentation or for anything which may not legally be excluded or limited. 8.7 You must give us a reasonable opportunity to remedy any matter for which we are liable before you incur any costs remedying the matter yourself. 8.8.4 such loss or damage relates to a business. 8.9 If you are a consumer (ie not acting in the course of a business), you will be responsible to us for any reasonably foreseeable loss or damage we suffer arising from your breach of this agreement (subject of course to our obligation to mitigate any losses). 8.10.1 To the extent allowed by law, you and we exclude all terms, whether imposed by statute or by law or otherwise, that are not expressly stated in this agreement. In this clause, any reference to us includes our employees and agents. 8.10.2 Our liability of any kind (including our own negligence) is limited to the price paid for the goods. 8.10.4 You will indemnify us against all claims and liabilities directly or indirectly related to your breach of this agreement. 8.10.5 This agreement constitutes the entire agreement between us with respect to its subject matter and supercedes any previous communications or agreements between us. We both acknowledge that there have been no misrepresentations and that neither of us has relied on any pre-contractual statements. Liability for misrepresentation (excluding fraudulent misrepresentation) relating to the terms of this agreement is excluded. 9.1 All trade marks, logos, content (including our website’s structure and layout), graphics, images, photographs, animation, videos, text and software used on this site are our intellectual property or that of our partners or suppliers. For the purposes of your personal non-commercial use only, you may view such material on your screen. You may not otherwise use, sublicense, retrieve, display, modify, copy, print, sell, distribute, download, hire, reverse engineer (unless permitted by applicable law) or create extracts of, or derivative works from, such material without our specific prior written consent. 10.1 If you create an account on our site, you acknowledge that this is for your personal use only and is non-transferable. You must not authorise or permit any other person to use your account. You must take reasonable care to protect and keep confidential your password and other account or identity information. You must notify us immediately of any apparent breach of security such as loss, theft, misuse or unauthorised disclosure or use of a password. You are responsible for third parties who use your account or identity (unless and to the extent that we are at fault). 11.1 We cannot guarantee that our site will be uninterrupted or error-free. We are entitled without notice and without liability to suspend the site for repair, maintenance, improvement or other technical reason. 12.1 We may link to third party websites which may be of interest to you. We do not recommend or endorse those sites or the products or services which they offer nor are we legally responsible for them as they are outside our reasonable control. You use such third party sites at your own risk. 14.1 Neither you nor we are liable for failure to perform or delay in performing any obligation (excluding payment) under this agreement if the failure or delay is caused by any circumstances beyond its reasonable control including third party telecommunication failures. 14.1 These T&Cs shall be governed by English law and any disputes will be decided only by the courts of the United Kingdom. 15.1 We may send all notices under this agreement by email to the most recent email address you have supplied to us (unless otherwise stated in this agreement). Headings used in this agreement are for information and not binding. Any failure by either party to exercise or enforce any right or provision of this agreement does not mean this is a “waiver” (ie that it can’t be enforced later). If any part of this agreement is ineffective or unenforceable for any reason, then it will be replaced with a provision which as far as possible achieves the same thing and the rest of the agreement shall continue to apply. A person who is not a party to this agreement shall have no rights under the Contracts (Rights of Third Parties) Act 1999 to enforce any term of this agreement except insofar as expressly stated otherwise. 16.1 If you have any complaints, please contact us via the contact details shown on our website or write to our address shown at the start of these terms and conditions. All content on our site or products is proprietary and is protected by copyright and intellectual property laws and may be covered by other restrictions as well. Elephant Art Limited content, products and services may not be copied, adapted, reproduced, replicated, duplicated, sold or otherwise exploited for any commercial purpose without our prior written permission.